As you guys know, the Impact Bag is one of the best, simplest, cheapest training aids that you can buy. It's a very simple device by design, but there's a new one out called Impact Cube from our friends at EyeLine Golf. Apparently, a bag isn't cool enough anymore. Now, we got to have this cube but you can do a lot of different things with this one. I'm going to show you today a couple different drills that we're going to focus on, and I'm going to give you a few different videos so you can work on each one of these separately. The first one I want you to notice is that the bag is almost somewhat trapezoidal shaped to a degree, and each panel has a different function. What I'm going to focus on in this video is this side here which if you look at it, it says 7 iron lean. What it's really doing is this panel is actually leaned in slightly about the amount that you would want with a mid-iron in terms of shaft lean. Now, the reality is pretty much every club in the bag is going to have roughly the same amount of shaft lean at impact. You don't want to try and change unless you're hitting a specialty shot which is what this panel is for which this one says wedge lean. If you look at this angle, that's a lot of shaft lean, a ton of shaft lean. Now, if you're trying to hit one extremely low, that's all fine and dandy. For pretty much every other club in the bag, and this is for the tour pros, their angle of attack only changes slightly. In fact, it goes from about six degrees down down to maybe three degrees down with the irons from the pitching wedge all the way down to a 3 iron. It's a really negligible small amount of change in the angle of attack and hence the shaft lean. When you're looking at and with a driver of course, we want that shaft to be pretty much upright. The good thing is this one side, the 7 iron side, is what I want you to practice with to get into a proper shaft lean position every time with every club in the bag. If you want to practice with your wedge, that's great. You want to practice with your 3 iron, it's all the same difference. Use the same 7 iron panel. How do we get into a proper shaft lean position? Well, hopefully by now you figured out there's a pretty simple secret to the swing the pros know and are doing in their swings and that you're probably not. That's learning how to get the shaft to lean with using the proper side of the body. The simple fact of the matter is if I use a left side, I'm always going to have shaft lean. If I use the right side, I'm pretty much always going to lose it. I want you to experiment with this. What you'll find is that if you use your right hand and right arm to release the club, you'll always have this pushing, flipping motion. The club head will hit the bag before the shaft does. You want the shaft to hit first or about the same time, give or take. When you have this panel that's sloped in slightly, if you just use your left hand and come down at impact, you'll always end up with your hand and the handle ahead of the club head. As long as you're not taking your thumb and pushing against the shaft, that's the only way that you're going to get the club head to the bag first. You always want the shaft to hit the bag first. Again, if you take your right hand and you start pushing against the wrist, you're always going to start flipping it. That's what creates these crazy thin shots, and top shots, and even fat shots. They're all directly related. They're just different amounts of timing. If you take this right hand out of it for a little bit, start practicing with your left hand only, get into this impact position. Then what I want you to do is then take your right hand and put it on the club. Now what you'll find, this is going to feel really weird if you're very right hand dominant. You're probably used to being like this with your head maybe in front of the ball, and the right hand and the right shoulder being in this dominant position. When you come in with your left arm only, you'll see that there's no need for your chest to ever rotate. Why would I turn at this point? Now in order to get shaft lean with your right hand, you would have to turn your body and get this right shoulder moved forward in order to get your hand into position where you could get shaft lean. Now, this is going to change everything in the swing. Obviously, we don't want to do this move. When you take your right hand off and release, and then bring your right hand on without rotating your chest, this is going to feel very different to you. You'll start to feel what it needs to feel like to get your right hand in the proper impact position which you'll notice that my right shoulder, to get the hand on the club, actually goes down slightly instead of across. That's a big, big difference in the swing if you're used to rotating your chest through and putting all this strain on your back, and your hip, and your knee, and your foot. All of that stuff is all coming from trying to get your right hand to get the club into the right position. It's a valiant effort, but you're never going to get the same result and just let it release properly with the left hand. Put these things together. Start practicing with the Impact Cube. You'll start finding as you use your left hand to let the club release, you'll get into a perfect shaft lean every single time. 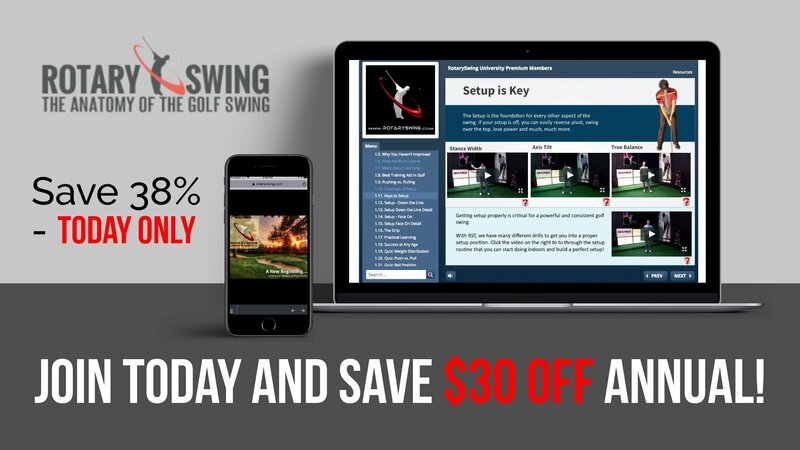 Get Your Free Membership to Finish Watching "How to Get Perfect Shaft Lean at Impact" Right Now!